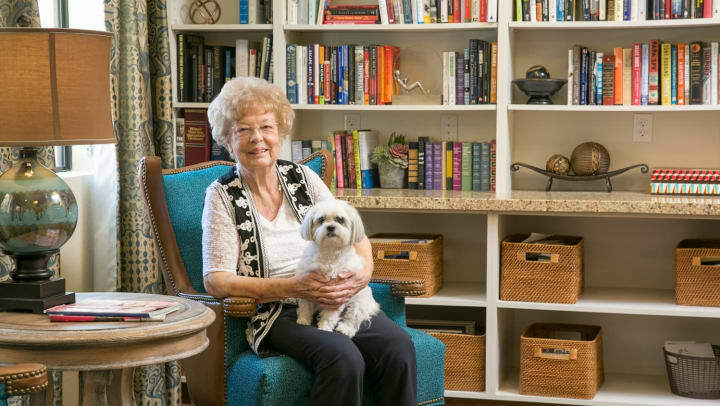 Some retirement communities offer pet-friendly senior living, encouraging residents to bring their cat or dog. But as parents get older, they need more help with their own care and daily activities. In these instances, you might wonder: Are they really in a position to care for themselves, let alone a dog or cat? Are the pros of pets worth the trouble? Certainly, it’s important to consider whether an aging adult is able to take good care of a pet. Companionship: Pets can provide companionship and help ease loneliness, which has been connected to poor health. Plus, pets can often encourage their owners to be more social. Dog owners are more likely to take walks or sit in the park with their pooch. Being out and about increases the odds of running into friendly faces in the community. Mental well-being: Research suggests that owning a pet can be good for the mood and the mind. A 2016 study in the journal Anthrozöös found pet owners reported more satisfaction with their lives. Similarly, studies of animal-assisted therapy in hospitals have found petting or spending time with animals can improve well-being. A study in the American Journal of Critical Care, for instance, found people hospitalized for heart failure had less anxiety after spending 12 minutes with a therapy dog. Physical health: A 2017 study in the journal The Gerontologist found older adults who walked a dog regularly tended to have a healthier weight and get more frequent exercise. They also reported fewer doctor visits and had fewer limitations on their activities. Heart health. A number of studies have suggested that owning pets or interacting with animals can lower blood pressure and improve heart health. A scientific statement by the American Heart Association determined that pet ownership – particularly dog ownership – is associated with lower heart disease risk. If you’re caring for an aging parent, tending to a pet’s needs can feel like yet another chore on your to-do list. But it helps to consider all the ways that Fluffy or Fido can improve your parent’s quality of life. Also keep this in mind: Some older adults resist moving out of their home because they fear they’ll have to give up their pet. In that case, a dog or cat can become an excuse to stay put – even if living in the family home is no longer the safest, healthiest option. By encouraging your parent to bring a pet along, you can ease the transition to senior living. At Heritage Communities, we understand that furry family members are important to our residents. That’s why we allow small pets in all of our locations ­– at no extra charge! Find a pet-friendly community in your area.